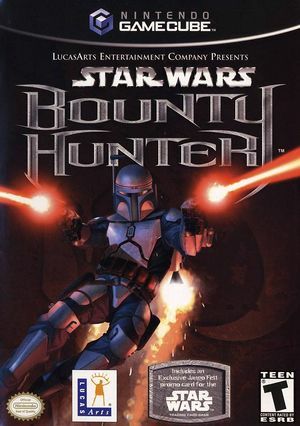 Star Wars: Bounty Hunter is a Star Wars video game. In the game, players play as the bounty hunter Jango Fett, featured in the 2002 film Star Wars Episode II: Attack of the Clones. In the game, Temuera Morrison reprises his role as Jango Fett from the film. The main objective of Star Wars: Bounty Hunter is to hunt Dark Jedi Komari Vosa. During the game, the explanation as to why Jango Fett is chosen as the template for the Grand Army of the Republic is revealed, as well as how Boba Fett, his cloned "son" is born. Players also fight many "bosses", such as Montross and Longo "Two-Guns". There are also side objectives, such as collecting secondary bounties, that open special bonus items in the game. When the player beats a chapter, blooper reels - comedic machinima productions - are unlocked. The graph below charts the compatibility with Star Wars: Bounty Hunter since Dolphin's 2.0 release, listing revisions only where a compatibility change occurred. 3.0-201 Windows 7 Intel Core 2 Duo e8500 @ 3.16GHz ATI Radeon HD 5750 Works okay. Grey screen when displaying developer intros in the beginning. Some slowdowns in crowded areas and a few random crashes. Otherwise good framerate 40-60. 4.0-2739 Windows 7 AMD Athlon II X4 635 @ 2.9GHz AMD Radeon HD 5800 Full speed (wasn't for a while since 4.0-871) sound gets garbled up when there's someone on the comlink and a fight going on. This page was last edited on 1 March 2018, at 08:13.